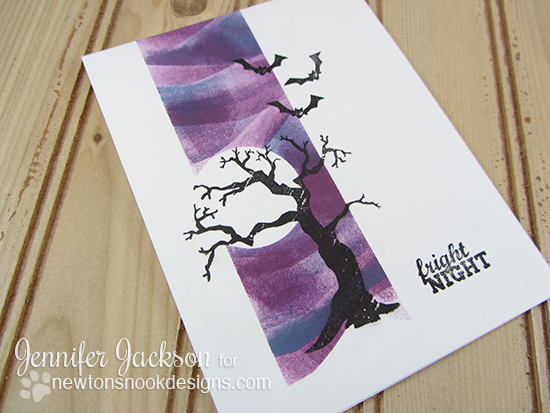 Newton's Nook Designs: One Layer Fright Night Halloween Card! Create a Spooky Card with Just one layer! Hello - Jen here today with a SPOOOOOOKY card! 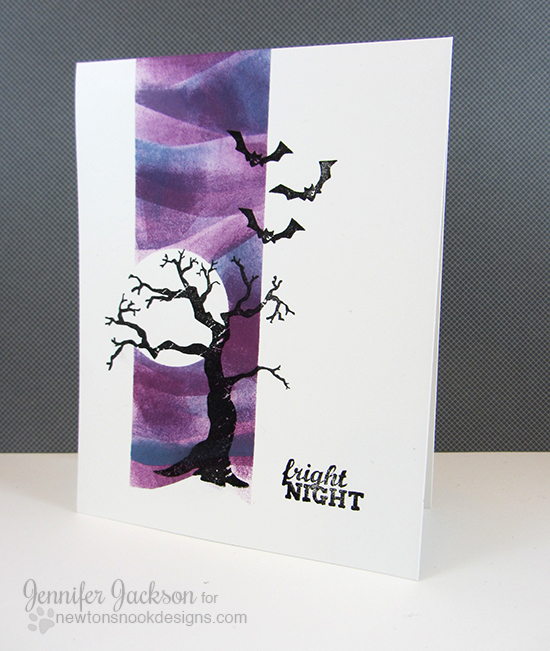 To create this card I first stamped the big spooky tree from our Spooky Street stamp set. Then I masked off a long rectangle on the white cardstock base right over the tree. I also added a masked circle punched out of a sticky note to make my moon. Then I used a sponges and distress ink to make layers of spooky clouds! After I was done sponging, I pulled off the masks to reveal the white moon and cardstock beneath. Then I added in the bats and the "fright night" sentiment! Are you getting excited for Halloween yet? I am!! Gorgeous! One-layer cards are the toughest but this looks amazing! What a beautiful one-layer card! Love the colors and the illusion of dimension! Cute. Love the skinny background technique. This is a great card! I've been trying to come up with some Halloween card ideas and this is exactly what I need - thank you so so much. Do you remember what ink colors you used for this? HI Kelly - They were Tim Holtz Distress inks - I think it was Dusty Concord, Seedless Preserves and Stormy Sky! Spook-tacular card, Jen! The sky is amazing, especially with that masked off moon behind the tree...Super cool!